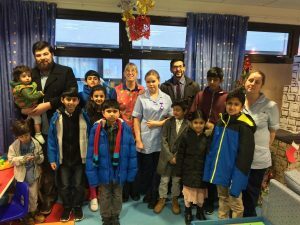 MEMBERS of Keighley’s Ahmadiyya Muslim Youth Association (AMYA) spent the first day of their holidays spreading some festive cheer to patients of Airedale Hospital’s Children Ward. Children took along toys, chocolates and season’s greeting cards for all 20 patients which were kindly donated by members of the local Ahmadiyya Muslim Community. An AMYA spokesman said: “As part of the teachings of Islam, we believe it’s essential to impart to children from an early age the essence of compassion and humility for all in society. Last month, members of the youth association were busy selling poppies as part of their ongoing work alongside the Royal British Legion. Dr Adeem Rubani, youth leader for the Keighley branch, said: “We try to educate young people that we have a moral and social responsibility to help our communities, especially those challenged by illness. Share the post "Keighley Ahmadiyya Muslim Youth Association helps cheer up youngsters in Airedale Hospital’s Children’s Ward"